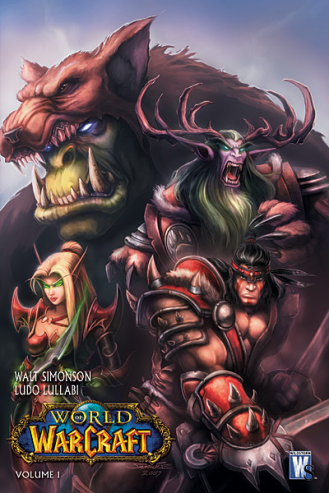 Blizzard, in association with Wildstorm Publishing, released their first ever World of Warcraft comic book which will be the first of a limited series of twelve. It's written by Walter Simonson (of Marvel's Mighty Thor fame) and penciled by Ludo Lullabi. The story is told over 22 pages of full-colored art. The story starts in Kalimdor where Rehgar, a former orc gladiator and now owner of his own gladiatorial team is in a bit of a pickle; his star gladiator, Bloodeye, has just died, leaving his team one man short for the Dire Maul arena games. What we quickly learn is that Bloodeye essentially was the team - his two teammates being mostly unprepared rookies. As luck would have it, Rehgar's caravan stumbles upon a human who is not only a skillful fighter, but also plagued with amnesia. Rehgar quickly see the opportunity and forcibly adds the human to his stable of fighters. They make their way to Orgrimmar, where the bulk of this comic book happens, there we get to learn more about the gladiators. Broll Bearmantle, a quick to anger druid and Valeera Sanguinar, a young brash and undisciplined blood elf and of course, our amnesic human (who goes by the name of "Croc bait") who has a past filled with fire and pain. Both elves are more interested in fighting each others than in honing their skills as warriors and our yet unnamed protagonist doesn't seem interested in fighting at all...until an outside danger forces them to rally up and "Croc bait" proves just how good a warrior he is and hints that he could be a great leader, which doesn't go unnoticed. The book ends on a cliffhanger, even thought it's quite obvious that the author won't be killing off his main characters in the second book of a twelve part story arc, it's still interesting to know how "Croc bait" is going to handle what appears to be a much stronger foe. Since the book is the first of a mini-series, it obviously creates more questions than it answers, but it goes about it in a proper way. It is rather heavy with text, character development and even some flashbacks. I can't help but compare this with the Sunwell Trilogy since I've just read it, but we essentially know more about those characters in one issue than we did about the Sunwell's casts over the course of the entire trilogy! Granted, the characters are stereotypical, bordering on cliché. An angry berserker, a foolish youth and an amnesiac isn't exactly ground breaking as far as character concepts go. The "gladiator" story is also less than original. But again, it all depends on where Simonson decides to take his story and what he wants to do with his characters. He still has 11 issues to twist things on their head and throw curve balls at us. As far as establishing the basis for a story, this first issue does a good job and does it in an entertaining way, which is all that can really be asked. From the "Wow-ness" point of view, this book is spot on. From the orange tint that permeates everything in Durotar and Orgrimmar, to the depiction of a crocolisk and the various races of Azeroth - this is Warcraft. The art is really well done, and while it might not have the same technical expertise as the Sunwell Trilogies, it strikes much closer to WoW's cartoonish and larger than life art style making, you feel right at home as you flip through the pages. The storytelling also takes full advantage of the Warcraft lore. Mention of the alliance, the scourge, the many tribes and factions of the Horde, the Dire Maul arena (where many players have fought) and heck, even the arena team games (which mimic the post burning crusade arena pvp system) all fits perfectly in the World of Warcraft. In Short, the first issue won't knock your breath out, but it is a well crafted introductory comic that stays very true to the source material and it should at the very least get you hooked up and wondering what's coming next. This page last modified 2008-10-02 19:54:09.